Chanuka, Hannukah, Channukah, Hanuka... I've never seen more conflicting spellings for one holiday - and all of them correct, too... 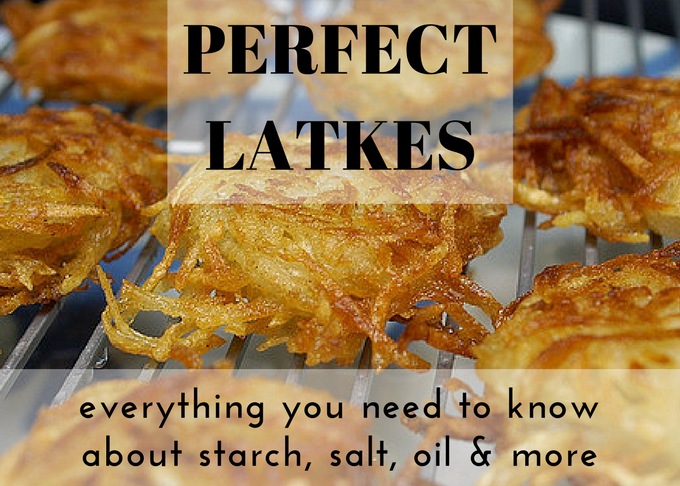 But no matter how you spell it, there is one thing everyone can agree on about Hanukah -- it's latke time! I love these crunchy yet tender potato pancakes. I'm even willing to put up with all the grating and the fact that my house will reek of oil for several days after frying them - they are that good. Don't skimp on the oil. You want there to be enough to cover half the latke when you put it in the pan - about half an inch - you will use a lot of oil but it's worth it. And be prepared to top up your pan part-way through the frying if your oil is getting low. Use an oil with a high smokepoint. I recommend either peanut or grape seed oils because they have a neutral flavor and can withstand higher temps without burning which makes them ideal for frying. Get the oil hot enough to fry the latkes quickly. This is one of the secrets of frying foods properly. If the oil is not hot enough, the food ends up absorbing far too much oil. But too hot and everything tastes burnt. Use a baking potato. Russets or Idahos are both good because they have more starch than many of the other varieties. Save the starch! Most people do not use the natural starch the potatoes leak when grated although it's very easy. You know that pinkish brown liquid that's left when you squeeze your grated potatoes out? Let it sit for a few minutes and the starch will settle at the bottom. Pour off the liquid and you'll be left with a delightfully layer of white starch that squeaks delightfully between your fingers. Pour the starch into your taters - it will help them hold together. Don't stop at potatoes. 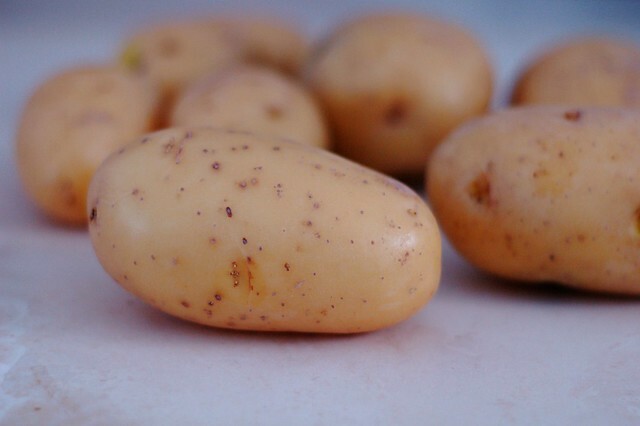 You can substitute another vegetable for up to one quarter of the potatoes. My favorite addition is celery root (a.k.a. celeriac) but you can also add parsnip or carrot or sweet potato. Use a brown paper grocery bag to drain the latkes. The paper bag is both sturdier and more absorbent than paper towels and also less wasteful. Just spread the grocery bag out on a baking sheet and keep them warm in the oven on low-heat while you fry. It takes forever to fry latkes if your oil is not good and hot. Consider making your own applesauce. It's so easy and it almost always tastes way better than anything you can buy in a jar. Here's my simple recipe for cinnamon applesauce. Do NOT pour your oil down the drain. It will congeal as it cools down and that is not good for your plumbing. I usually pour mine into a plastic container with a lid (or a glass jar) and put it in the trash. Or, if you live near a biodiesel fueling station or someone who collects used cooking oil to run their car, donate it to them to give it a second life. 1. 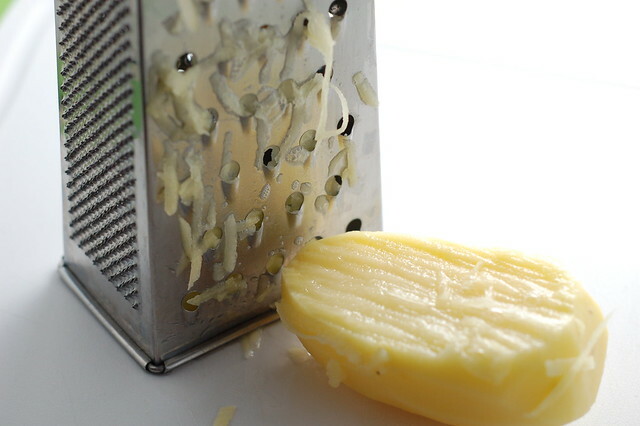 Grate the potatoes and celery root using either a box grater or a Cuisinart with grating attachment. Some people prefer their potatoes more finely grated and some more coarsely grated - it is up to you. 2. Grate the onions into a separate smaller bowl then wring the moisture out of them by either squeezing individual handfuls or by placing them in a clean dishtowel and wringing them out that way. Throw the dried onions in a large bowl. 3. Wring out the potatoes and celery root in the same fashion, placing the dried out gratings in the large bowl with the onions. 4. Let the remaining potato mixture sit for a few minutes. Once it has settled, pour off the liquid on top. A layer of white potato starch should remain at the bottom (it has a great texture - rub your fingers together to feel how it practically squeaks!) Scoop out the starch and add it to the potato, onion and celery root mixture in the large bowl. 5. Add the eggs, salt and pepper and mix thoroughly. Then add the flour or matzoh meal and mix to combine. Use your own best judgement - you want the mixture to stick together but it should not be dry. 6. Add the oil to the cast iron skillet or saute pan and heat over a medium high flame until a shred of potato sizzles. It should be very hot but NOT smoking. Add the latkes with a small amount of space between them to allow for flipping - I usually just ladle a large spoonful of the mixture into the pan and fry until they are browned on the bottom and the sides are crispy. Flip and cook the other side until golden brown. This should take roughly 3-5 minutes on each side. 7. Drain the latkes on a paper bag. You can keep the latkes hot while you finish frying by placing them on an ovenproof plate or baking sheet in a warm oven. Serve hot with sour cream and applesauce. Any suggestions for an egg replacement? Maybe silken tofu? Mmmm. Looks so good! 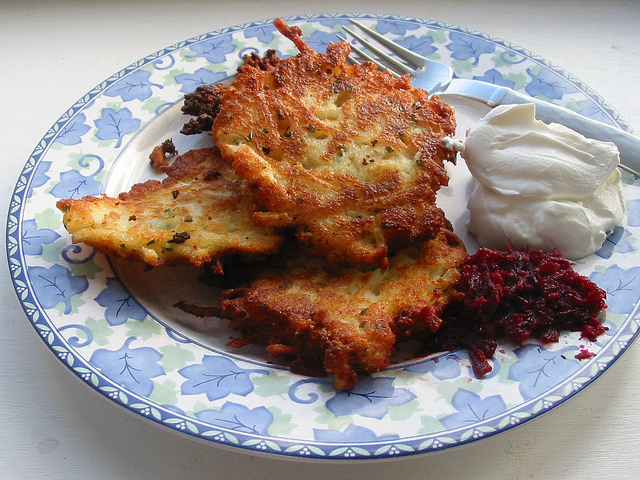 Wanna come over for a Latke party? Its snowing here - for Eli's first (aware) night of Hanukkah.